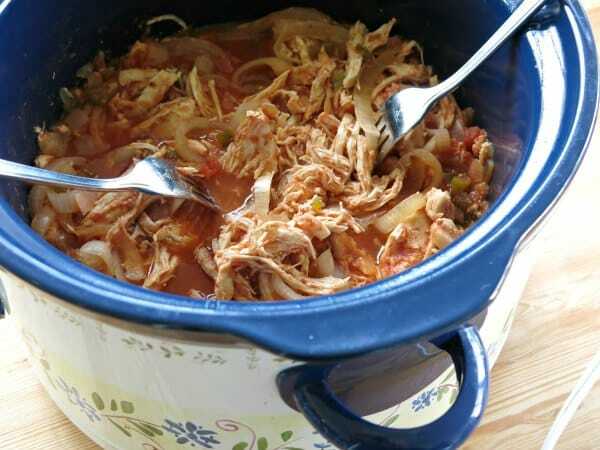 3 Ingredient Salsa Chicken made in a crock-pot seems to good to be true! 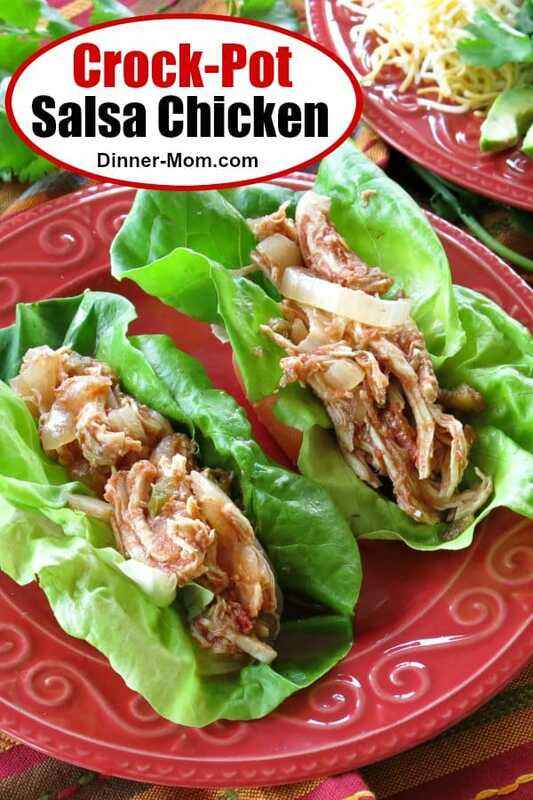 Not only is it delicious and easy to make, but it’s lower in carbs, gluten-free and there are so many ways to use it! In fact, only 2 ingredients are absolutely required: chicken and a good salsa. We used these same ingredients to make Slow Cooker Pork Tenderloin with salsa. It works! Or, if you’re looking for something creamier, toss a few cubes of cream cheese into the crock-pot too. It will blend into the chicken when you shred it. 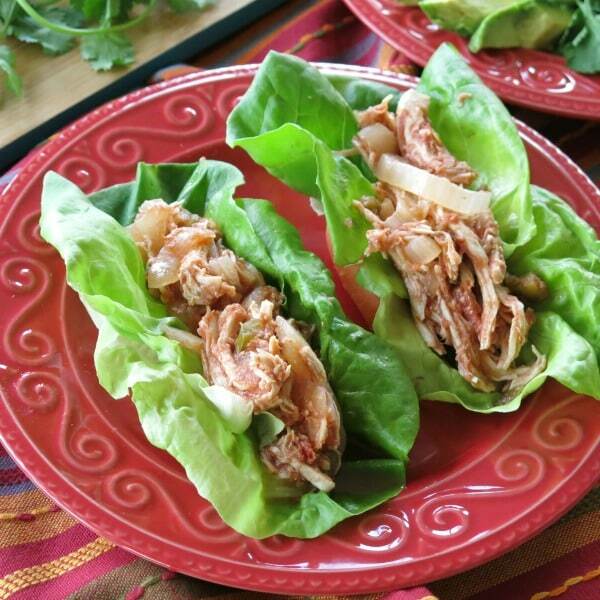 This variation is inspired by our Slow Cooker Chicken Salad recipe. Once it’s done you can enjoy it in a big bowl. Or, it becomes a base for Mexican dinner dishes like tacos, salads, and rice bowls. 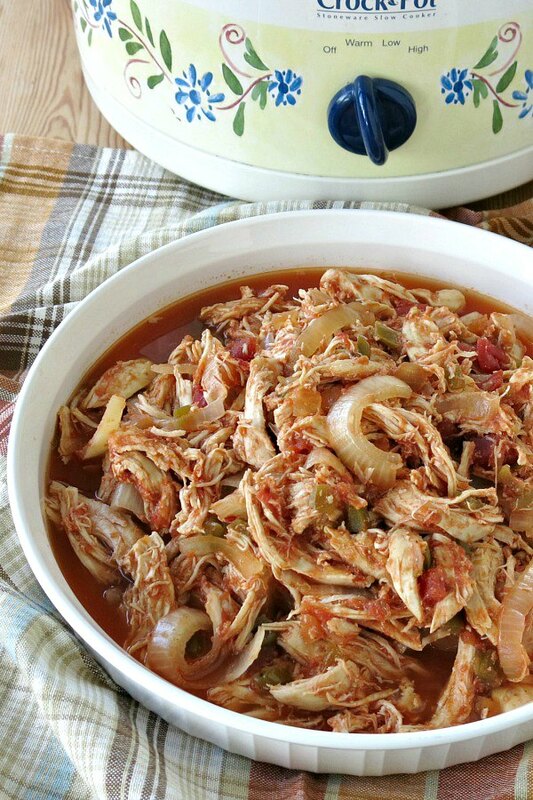 To make this recipe, simply layer chicken and sliced onions in a slow cooker. Pour salsa over the top. Cook on low for 3-4 hours or on high for 6-8 hours. When it’s done, use two forks to shred the chicken. It’s best to do this step right away while the chicken is warm. As the chicken cools the chicken muscles start to firm up. Salsa is the workhorse of this recipe and contains all the spices and juices you need. The key is to find one that you LOVE. See all the peppers and tomatoes throughout the shredded chicken? I used a chunky salsa! If you have picky eaters in the house, then you may want to stick to a very smooth salsa. Choose a salsa that has no added sugar to keep the carbs down. And, if you happen to be a family of adventurers, then try a fruity salsa like peach or mango. Switching up the salsa in a recipe is a trick I love which completely changes the flavor of a dish. I do this all the time with dishes like Burrito Pie Casserole! By the way, a fruity salsa will give this recipe a Jamaican or Hawaiian appeal. We add our favorite products to our Amazon Store or check out this 5 minute restaurant salsa by The Chunky Chef. There are lots of ways to enjoy this chicken dish. It’s the recipe that keeps on giving because the base works well in so many other dishes! Our favorite sides or additions to these recipes are Simple Guacamole Dop, microwave corn on the cob and fresh corn and black bean salsa. 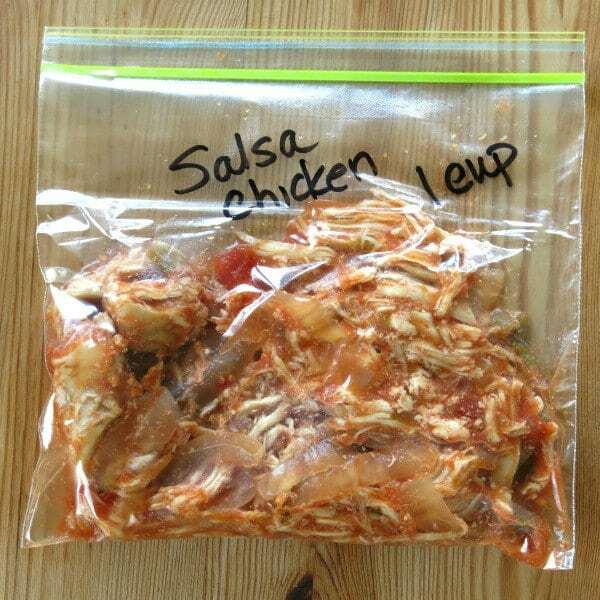 If you’re not sure what to do with the leftovers, freeze them! Place chicken in a resealable bag, removing as much excess air as possible. Label and store in the freezer. For best results, use chicken within 2 months. To defrost it, place the bag in the refrigerator overnight. Or, remove the chicken from the bag and defrost it in the microwave. 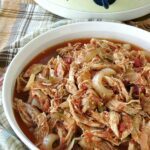 Crock-Pot Salsa Chicken, with just 3 ingredients, is easy and healthy! Make it on Sunday and have tasty salads, soups, and rice bowls all week long! Spray inside of the crock-pot with non-stick cooking spray. 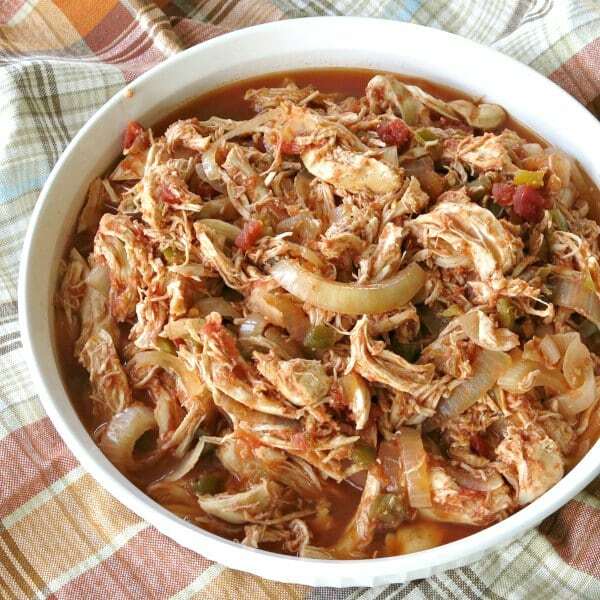 Place chicken in a single layer in the bottom of the crock-pot. Layer onions and salsa on top of the chicken. Open lid and use two forks to shred the chicken and then stir to coat all the pieces with the sauce. Check chicken with a meat thermometer to make sure chicken is cooked to a temperature of 165 degrees F.
Love this recipe! Definitely a new favorite dinner recipe. What a great idea! 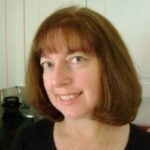 Another winner for my crock pot!